You've Never Seen a Set Like This -- and Who Knows When You Will Again? As a collector, you probably have a fair share of United States Mint proof sets and uncirculated coin sets. You might even have a few silver proof sets or limited edition silver proof sets. But you've never seen a set like this! 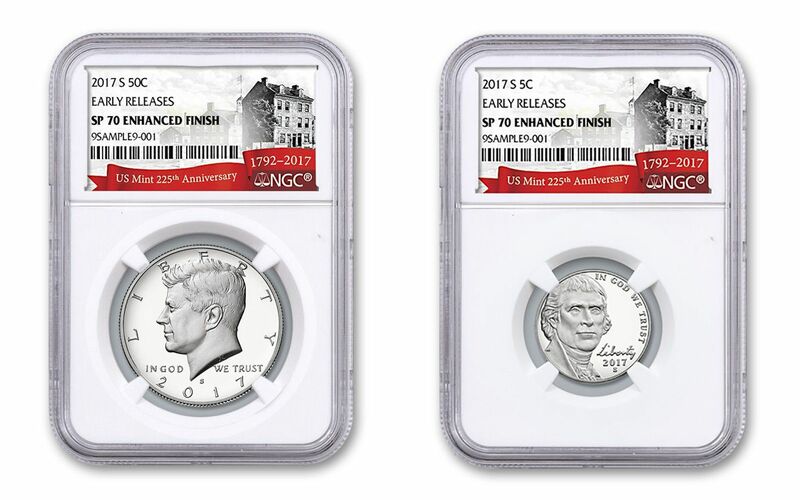 As part of their 225th anniversary celebration, the U.S. Mint is introducing their very first enhanced uncirculated coin set for 2017. Harkening back to the special mint sets of the mid-1960s, this unique collection combines the elements of both proof and uncirculated coin sets for something truly special! A SOLUTION OF THE '60s . . .-- Faced with a coin shortage, the U.S. Treasury Department pulled the brakes on proof and uncirculated coin sets in 1965. Incensed collectors demanded their return, so the U.S. Mint created special five-piece mint sets of coins struck on polished dies. This temporary solution, in place between 1965 and 1967, had just one problem. In order to give these coins their special finish, the mint technicians ended up over-polishing the dies, completely obliterating some of the coins' smaller details!
. . . 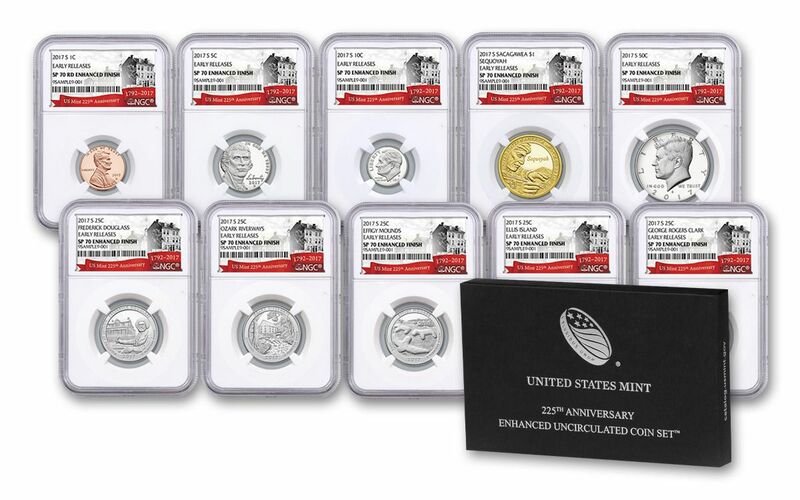 MEETS THE TECHNOLOGY OF TODAY!-- This 2017 225th Anniversary Enhanced Uncirculated set revisits that original idea, only this time by producing stunning coins without sacrificing a thing! Each coin in this 10-piece set is struck with care at the San Francisco Mint (as you'll see by each coin's "S" mintmark). Then, using state-of-the art technology, each coin is enhanced with gorgeous laser-frosted details over unpolished fields. The result? Dazzling coins featuring the sharp details of proofs with uncirculated finishes! 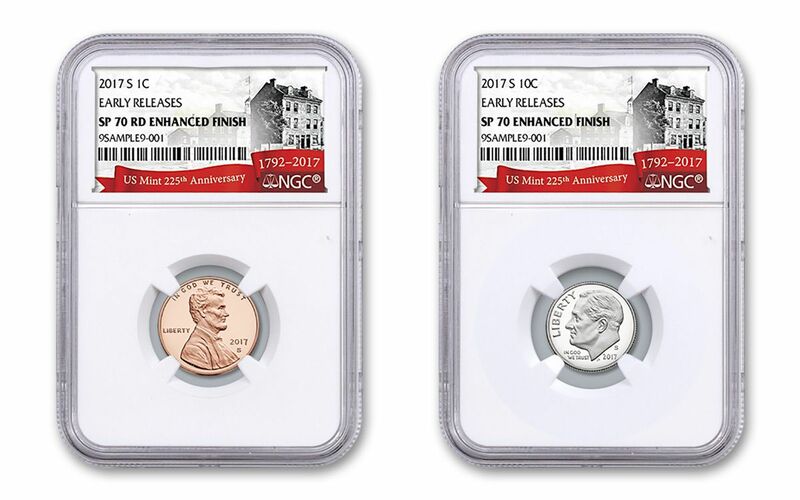 ALL CERTIFIED FLAWLESS AND EARLY RELEASES!-- Each coin in this 2017 225th Anniversary Enhanced Uncirculated Set comes certified Specimen-70 (SP70 UC) by Numismatic Guaranty Corporation (NGC), a distinction that means your perfectly-graded coins will have ZERO imperfections -- showing all features and fields exactly as the engraver and mint intended! 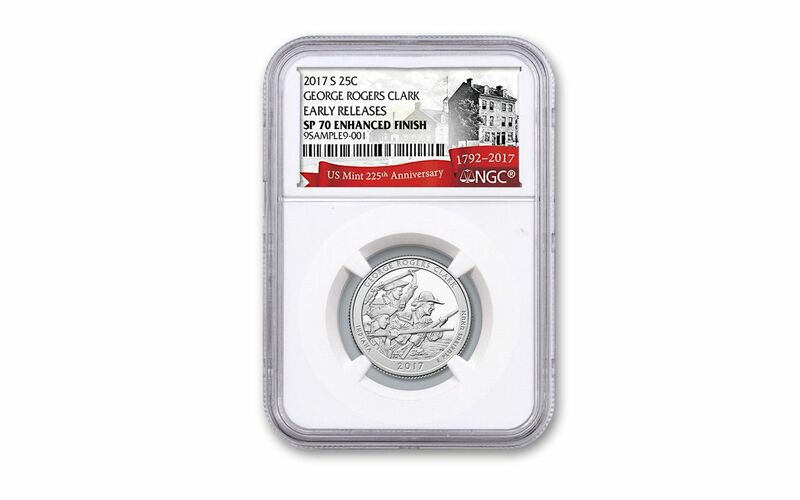 In addition, each coin will be certified Early Releases (ER) by NGC, meaning that they were among the first struck by the mint and were verified within the first 30 days of issue. 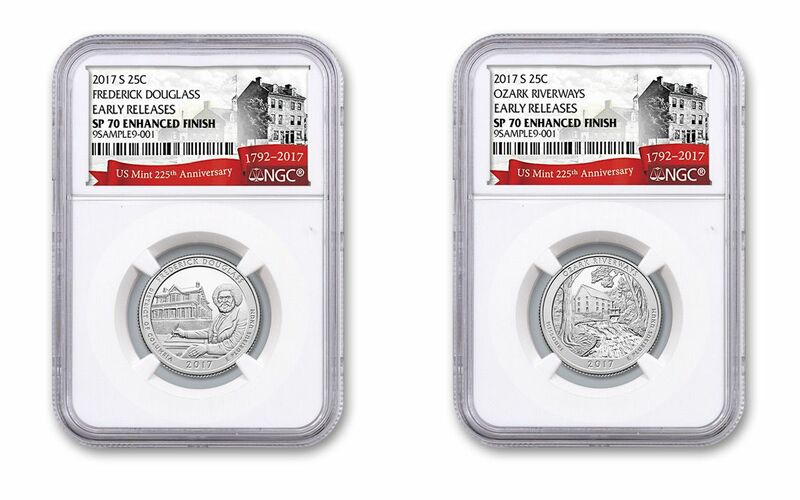 Finally, each coin will be sonically sealed in its own acrylic case with a 225th anniversary label -- giving you the best in protection while granting clear sightlines into every beautiful detail. THE FIRST . . . AND ONLY? 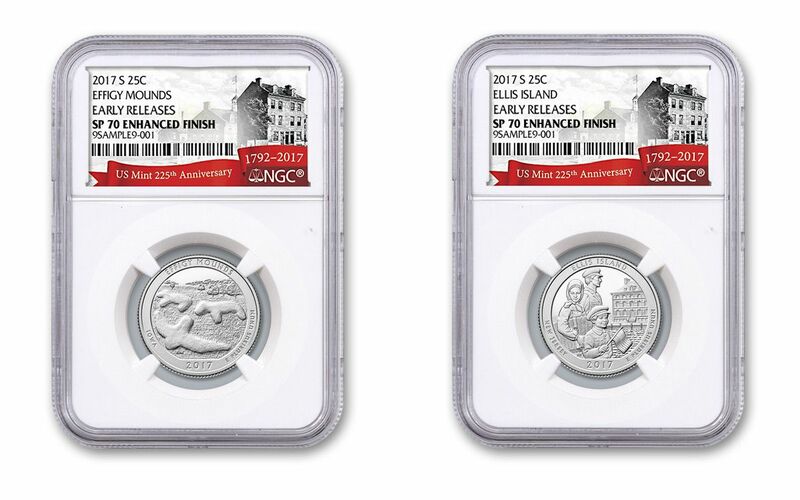 -- 225,000 of these sets will be released by the U.S. Mint. 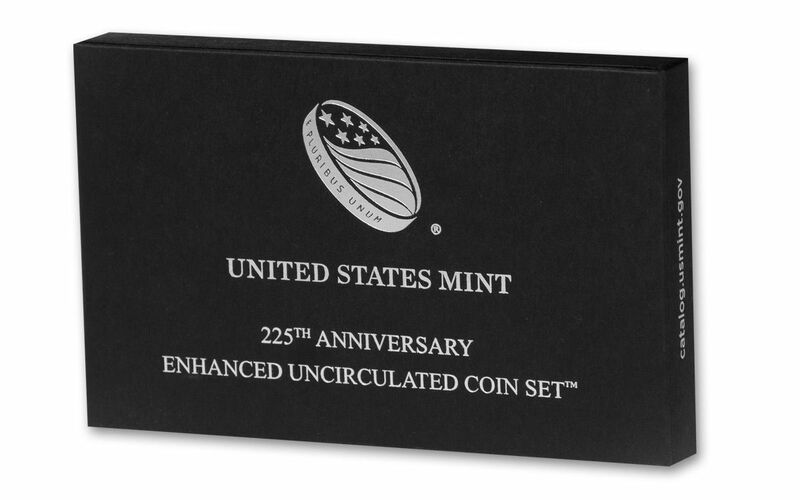 However, from all indications, this Enhanced Uncirculated Set is likely a one-time-only event to commemorate the mint's 225th anniversary. Will there be a follow-up in the future? Only time will tell! It doesn't matter if you've never missed a mint set or you're just getting started on your first year -- no U.S. Mint collection is complete without this 2017 225th Anniversary Enhanced Uncirculated Coin Set! 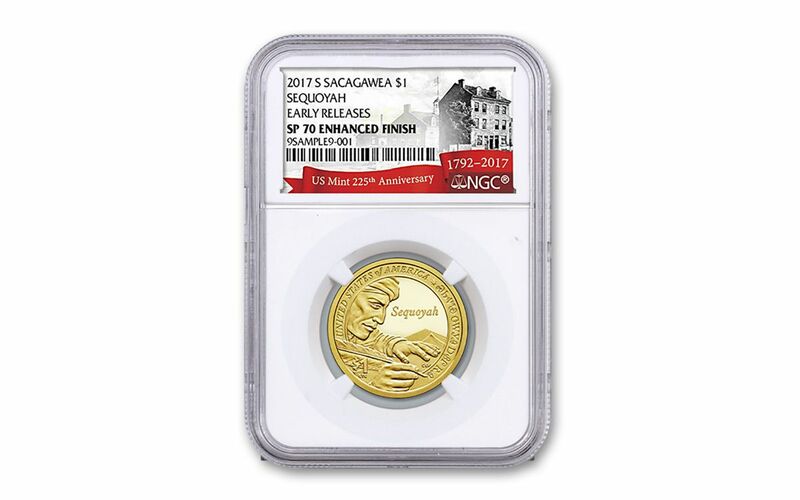 Don't wait until these coins become history -- add it to your cart today!